Wondering what to wear to an 80s party? Whether you are hosting the 80s theme party or just attending as a guest, choosing the right costume adds to the fun of the night. The 80s offered an eclectic collection of fashion trends, allowing for several different options for dressing for an 80s party. Choose the style that best fits your personality. The hair band rocker look screams 80s. Acid washed, bleached and ripped jeans or black leather pants work well for this look. A tight t-shirt with the sleeves ripped off or a spandex tank top finishes off the clothing portion of the costume. Add a long-haired wig to finish off the look. Khakis and polo shirts embody the preppy style of the 80s. A khaki skirt for women and khaki pants for men start off this 80s dress idea. Add a brightly-colored polo with the collar up and a sweater tied around the shoulders. Penny loafers are the preferred form of footwear for the preppy style of 80s wear. A leather skirt or pants highlights the punk style of dress from the 80s. A leather vest, particularly for men, can top off punk clothing. Look for bright colors of temporary hair color to add fun stripes of color to your hair. You may also be able to find a wig at a costume shop that fits the punk style. Dark eye makeup, a fake or real nose ring, red lipstick and a choker-style necklace offer fitting accessories to round out the punk look. Puffy sleeves, bright colors and lots of organza highlighted the average prom in the 80s. Pull out your own 80s prom dress or raid the closets of friends and family who grew up in the 80s. A thrift store may also land you a vintage, puffy-sleeved dress. Any fashionable prom attendee in the 80s purchased a pair of shoes dyed to match the dress. Round out the look with rhinestone jewelry and a wrist corsage. You can't talk about 80s costume ideas without mentioning Miami Vice. Wearing t-shirts under suit jackets was popularized by Don Johnson's character in the popular TV show. Tom Selleck's character in Magnum, P.I. popularized the Hawaiian shirt look of the 80s. Either of these looks are simple to achieve for men attending an 80s party. The popular movie inspires generations of 80s party-goers who want to dress the part. The costume takes only a few articles of clothing yet begs to be worn to an 80s party. A black leotard paired with black leg warmers and a large, gray sweatshirt does the trick. Cut out the neck of the sweatshirt so it hangs over the shoulder to truly embrace the Flashdance craze. Big hair was the name of the game in the 80s. Grab a can of Aqua Net hair spray and start styling. Wearing a costume to an 80s party adds to the fun and excitement. If you grew up in the decade, it gives you a chance to relive your youth for one night. 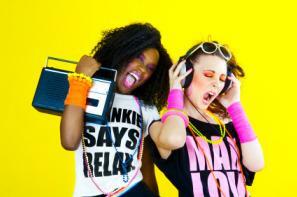 Consider your personal style when deciding what to wear to an 80s party. Have fun and add as much of the decade to your costume as possible. When it comes to the 80s, there's no such thing as overdoing it.